Now even the smallest of gardens can produce a good crop of veg! 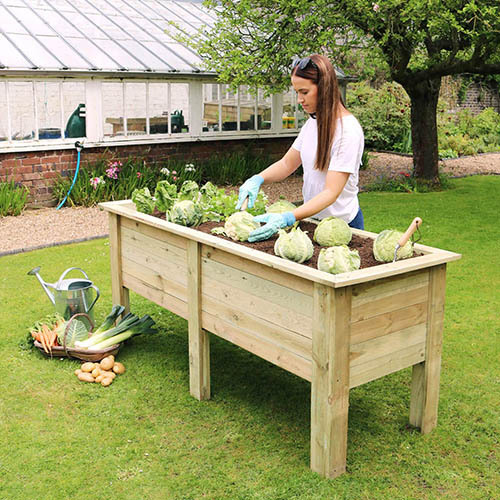 A stylish wooden raised planter ideal for growing deep rooted vegetables. Limits the need for back-breaking bending and stooping. Elevates crops up & away from pests and small animals. Available in 1M and 1.8M lengths for a wider selection of crop growing. Made from FSC Certified, pressure treated timber. Raised for your convenience, the Deep Root Planter is ideal for growing deep rooted vegetables, such as carrots and potatoes with absolute ease. Limiting the need to bend over or stoop, the elevated height is also great for protecting your crop from unwanted pests and is an ideal alternative for growing your own if you don't have space in beds or borders. The Deep Root Planter makes growing deep rooted vegetables, such as carrots and potatoes incredibly easy. Raised off the ground, the planter minimises the need for bending, whilst protecting your crop from unwanted pests. The planter can hold up to 500 litres of soil (approx.) with its bed depth of 380mm (approx.). Smaller garden? The Deep Root Planter is also available in a compact 1m width size.